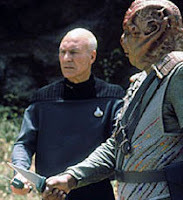 Recently I saw again one of the most famous episodes of Star Trek Next Generation, "Darmok and Jalad at Tanagra." I sat riveted, seeing with new eyes how this story reflects my adventure with Bishop Thomas and the biblical literalists at Highview. In the show, Captain Picard confronts an alien race that communicates only via metaphor from its ancient myths--just as my new friends at Highview attempt to solve all problems with stories from the Bible. Struggling to communicate, the alien captain beams himself and Picard to a planet where a beast is loose, and he repeatedly says to Picard, "Darmok and Jalad at Tanagra!" Picard is confused and shivering in the cold until the alien captain offers him fire saying, "Temba, his arms wide!" their peoples by fighting the beast together with Picard. Alas, the alien, Dathon, is mortally wounded by the beast. 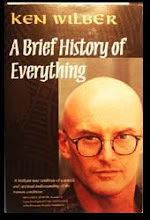 As Dathon dies, Picard shares with him the story of "Gilgamesh and Enkidu at Uruk." Dathon dies knowing he has succeeded in opening communication with Picard. Picard returns to his ship with enough knowledge to halt the war that is brewing with Dathon's people. And that is the story in my book, "The Bishop and the Seeker: Wrestling for the Soul of the 21st Century." As a postmodern Integralist and follower of New Thought, I am beamed into the office of a fundamentalist bishop for a year of dialogue where we discover our common enemy: the excesses of postmodernism and alternative religion in which there is no right and wrong. We tell each other stories and learn each others' language. The bishop's equivalent of "Temba, his arms wide" is to offer me the openness to be genuinely interested in learning about my world. In fact, he risks his reputation among some of his own hardliners by telling me he believes I am saved, even though I do not call myself Christian. I return to my ship to bring the message. We can work with these people, they can be friends. Instead of focusing on our differences, look at the good work we can do by focusing on our common aims to bring truth, beauty, and goodness to the world.